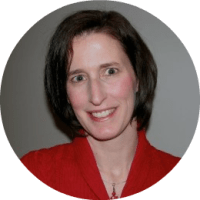 Hello Belle of the Kitchen readers! 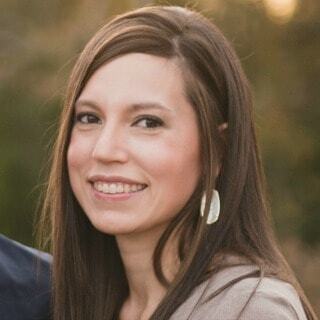 I’m Carrie from Kenarry: Ideas for the Home where we create and curate useful tips, delicious recipes, easy DIY projects, fun kid activities and other ideas to help you make your home into a place your family loves. 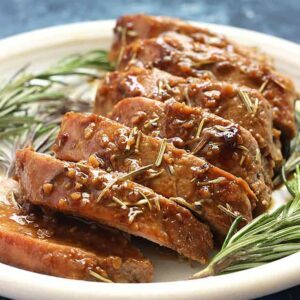 Each month, I love visiting you here at Belle of the Kitchen to bring you new recipes and ideas for the kitchen. 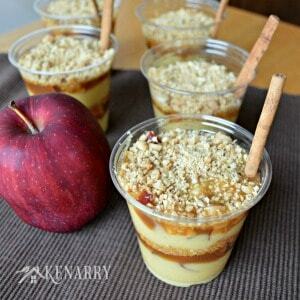 If you enjoy sweet and salty desserts, you’re going to love this month’s recipe. 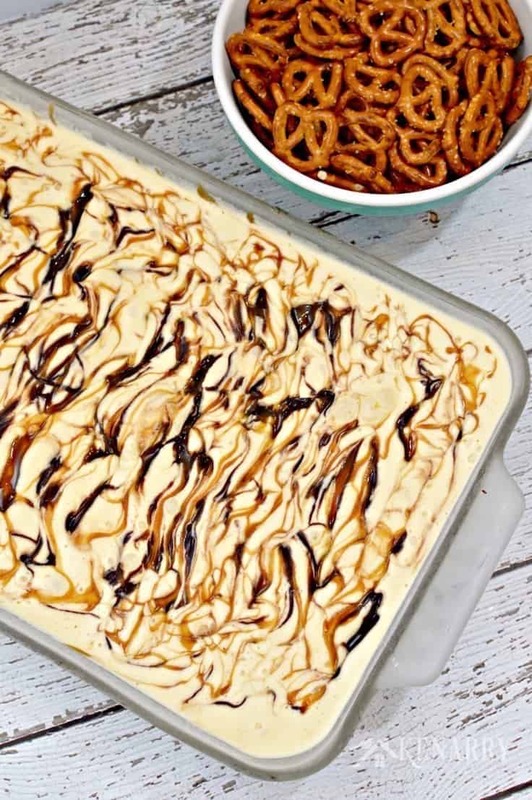 Caramel Fudge Ice Cream Cake is a delicious summer treat that combines layers of ice cream with hot fudge and hot caramel – all on a buttery pretzel crust! One of my favorite summer time treats to make are ice cream cakes. You can combine different ingredients in many different ways to create unique and delicious ice cream desserts to serve your family and friends. Some have chocolate or vanilla cookie crusts while many others have graham cracker crusts. 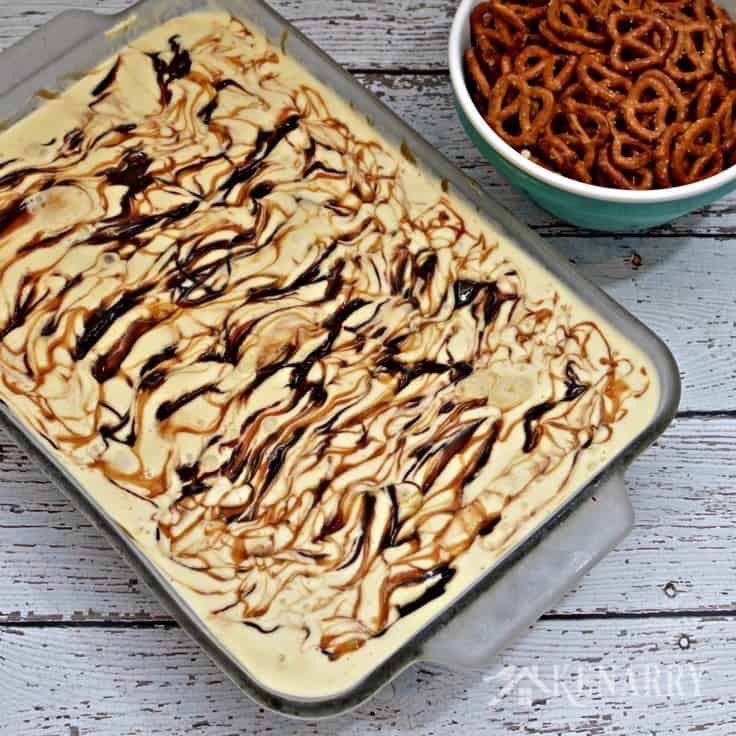 For today’s ice cream cake though, I wanted to try something new — a pretzel crust! If you’re a fan of sweet and salty combos, it really doesn’t get much better than chocolate and pretzels, does it? While I love chocolate covered pretzels, I think it’s also fun to combine these two delicious ingredients in other ways. And while we’re at it, why not throw in some caramel to sweeten the deal, am I right? 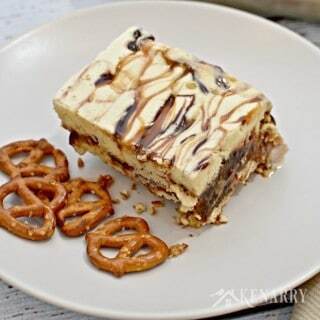 I initially made this Caramel Fudge Ice Cream Cake with a pretzel crust for my Bible study group. It was a huge hit with my friends and I just know yours are going to love it too. You start by crushing mini pretzels and combining them with melted butter to make the crust. I recommend putting the pretzels in a large resealable bag and breaking them into bits using a rolling pin. You may even need to pound them with the rolling pin for a bit to break them into smaller crumbs. 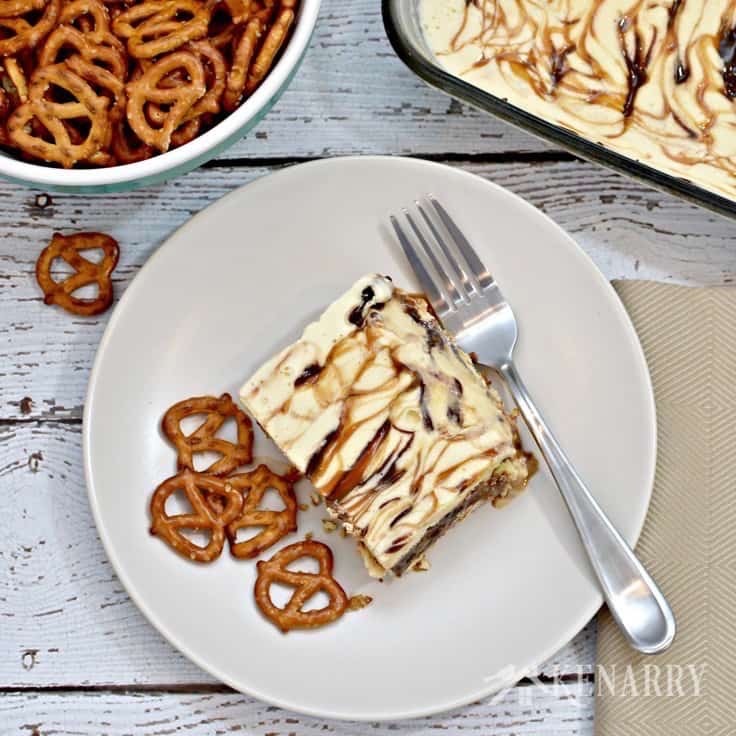 Once the pretzel crust for the Caramel Fudge Ice Cream Cake has hardened in the freezer for about 30 minutes, you’re ready to start layering the remaining three ingredients – french vanilla ice cream, hot caramel and hot fudge. 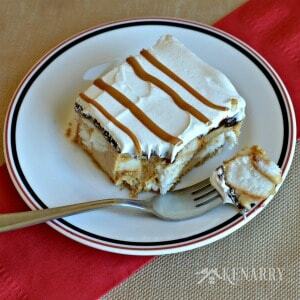 For layered recipes like this Caramel Fudge Ice Cream Cake, I like to buy the kind of ice cream that comes in a boxed carton. 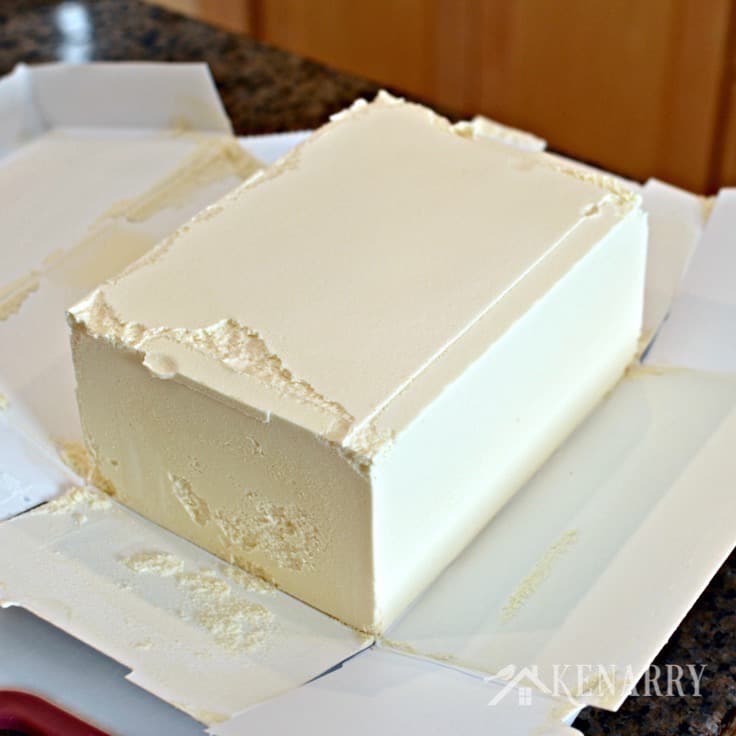 You can then unfold the carton and use a knife to easily slice the ice cream to make layers. If you only have the tub kind of ice cream, you may need to let it soften for a bit so you can divide it into thirds. Next, place another layer of french vanilla ice cream on top of the hot fudge. You don’t need to worry about blending the slices together at this point. Drizzle hot caramel topping across the second layer of ice cream, then place the third and final layer of ice cream on top of that. 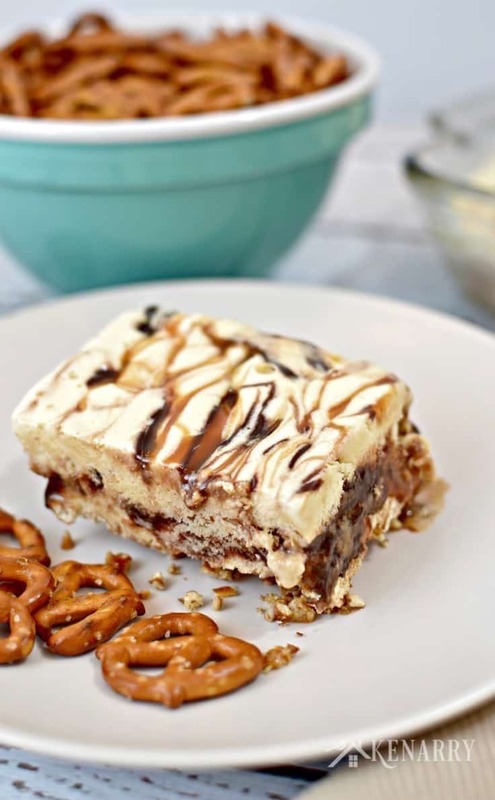 Once the final layer of ice cream is in place, drizzle the remaining hot fudge and hot caramel across the top of the Caramel Fudge Ice Cream Cake. 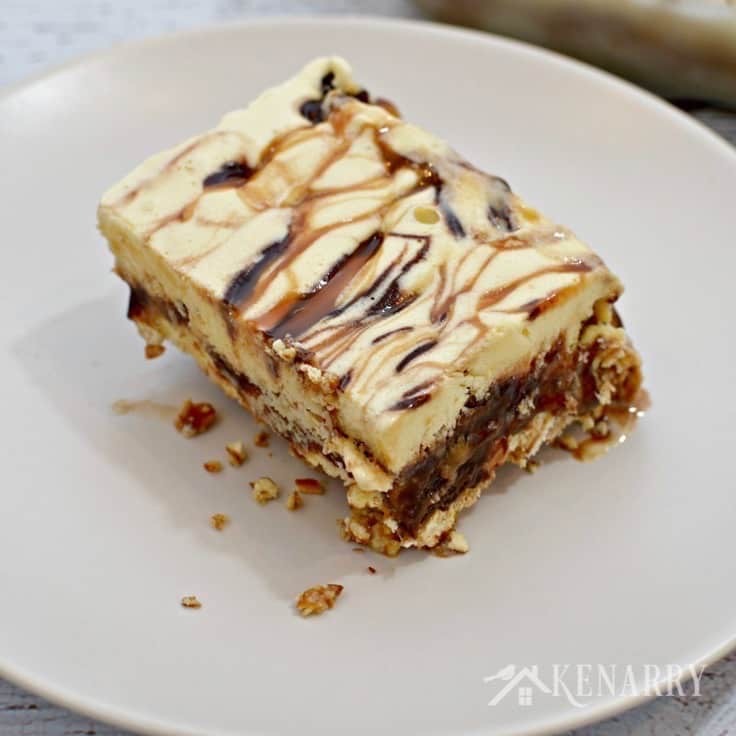 The hot toppings will melt into the top layer of ice cream giving the cake a beautiful marbled appearance. Put it in your freezer overnight so the layers can blend together. Before you serve it let it stand on the counter for 5-10 minutes to make it easier to cut through the Caramel Fudge Ice Cream Cake. As you can see in the photo below, once you slice into the ice cream cake, you can no longer see the separate layers. In a large resealable bag, crush pretzels with a rolling pin. In a bowl combine the crushed pretzels and melted butter. 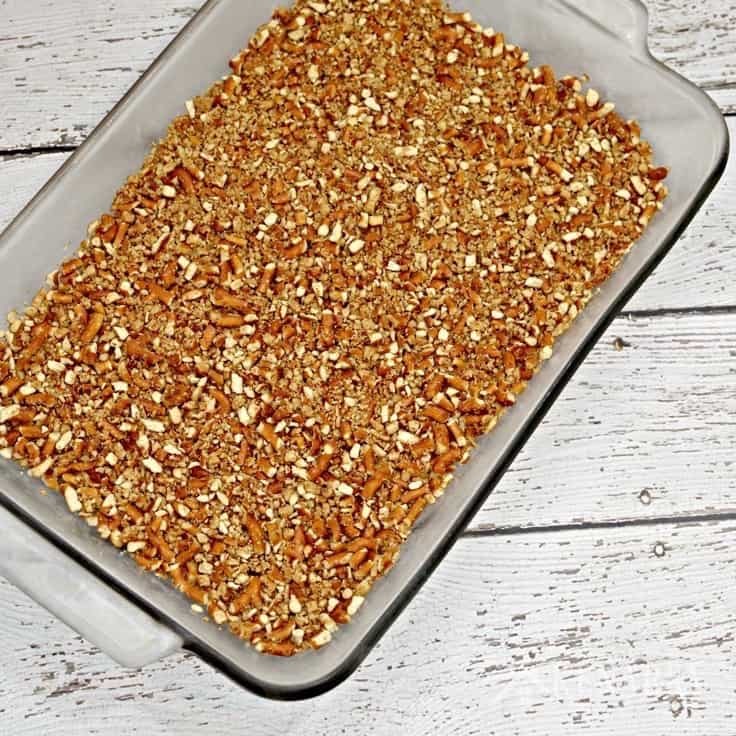 Spread the pretzel mixture on the bottom of a lightly greased 9 x 13" glass baking dish and gently press down to form a crust. Put the pretzel crust in the freezer for 30 minutes. Now mentally divide the french vanilla ice cream into thirds. 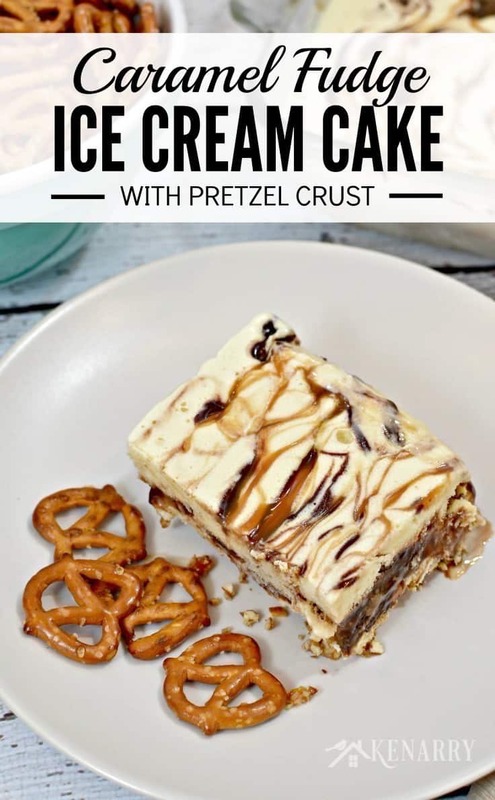 Layer the first 1/3 of ice cream on top of the pretzel crust. Put the hot fudge in the microwave for 45 seconds. Drizzle half of it on top of the first ice cream layer. Next, place another layer of ice cream on top of the hot fudge. Put the hot caramel in the microwave for 45 seconds. Drizzle half of it on top of the second ice cream layer. Spread the rest of the ice cream on top of the caramel layer and lightly smooth with a spoon. Drizzle the remaining caramel and hot fudge across the top of the ice cream cake. NOTE: You may need to reheat the caramel and hot fudge in the microwave for an additional 30 seconds to make it easier to drizzle. 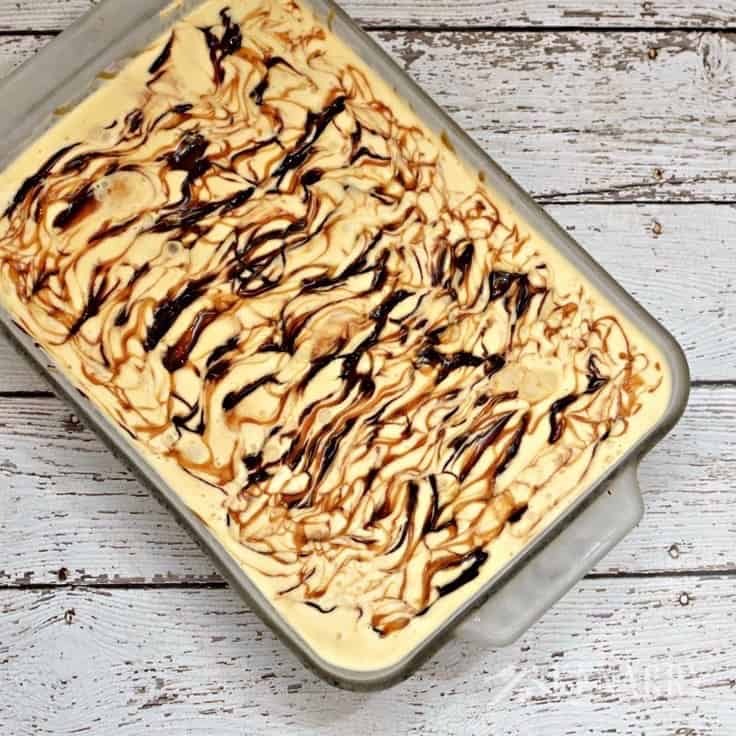 Freeze the Caramel Fudge Ice Cream Cake overnight. 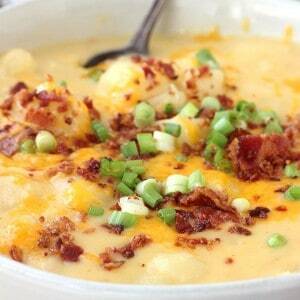 Let it sit on the counter for 5-10 minutes to soften a little before serving. Enjoy! 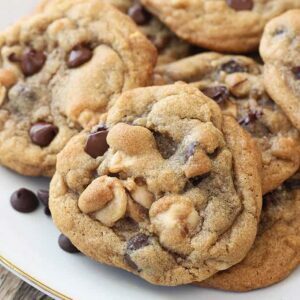 Add chopped nuts, toffee bits or mini chocolate chips between the layers to give a little added crunch to each bite. If you like a creamier ice cream cake, you can add a layer of frozen whipped topping after the hot fudge and then again after the hot caramel. 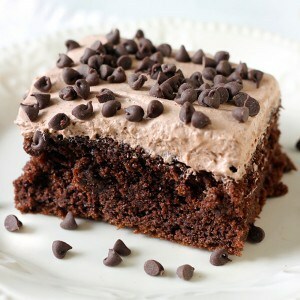 Or you could just use the whipped topping on the very top like a frosting. Not a fan of caramel? 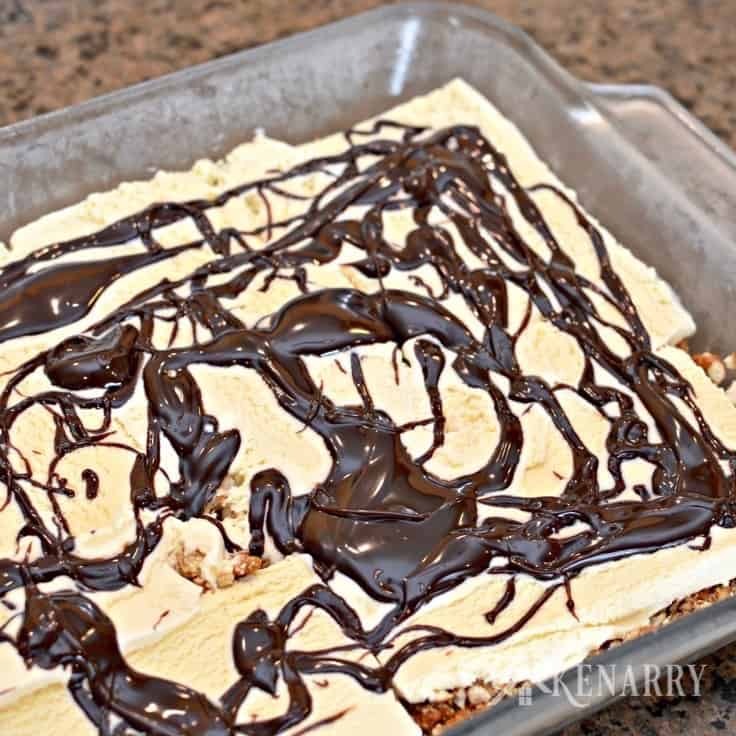 Substitute it with peanut butter instead for a delicious twist on this ice cream cake recipe. You would heat the peanut butter in the microwave before you drizzle it, just like you do with the hot caramel topping. Instead of french vanilla ice cream, you could use almost any other ice cream flavor available at your local grocery store. I think cookies and cream ice cream or chocolate chip ice cream would both be great alternatives. 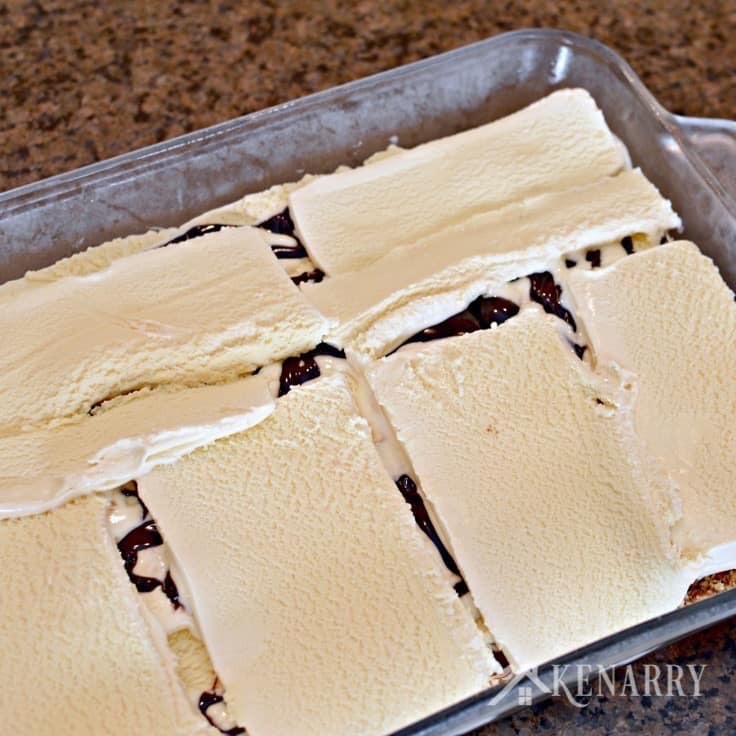 What’s your favorite way to make an ice cream cake? Please comment below and share. Ashlyn and I are always looking for new ideas for the kitchen.